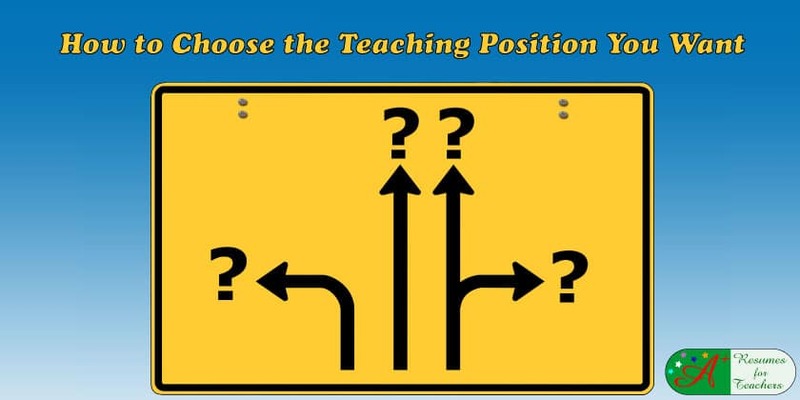 Take the correct steps to choose the teaching position that is right for you. Now that you have decided to enter the world of education, you need to pick a subject area that interests you. For many teachers, choosing the type of job is easy. They follow their passion. While for others, it can be difficult. Which of these subjects do you find the most interesting? If you are a career changer, teaching may be a foreign concept to you, particularly if you have no prior instructional experience. Before you develop the first draft of your resume, you need to know exactly what is required of an educator, as well as the subject area you would like to teach. Once you have a better understanding of the fundamental tasks, you can tailor your resume and cover letter appropriately, and prepare yourself for the interview that is sure to follow. The age level you wish to instruct will also determine additional tasks. For instance, if you are interested in early childhood education, the use of lectures will be minimal, whereas hands-on activities, play-based learning and demonstrations will be frequent teaching methods. Interaction with parents will increase significantly when educating children of a younger age. Your tools will be different too. Arts and crafts, songs, role-playing, games, storytelling, and the like are commonly used to attract and hold a young child’s attention. The content area you would like to teach will affect your tasks and tools as well. For example, Science teachers utilize laboratory beakers, hot plates, Bunsen burners, microscopes, dissection tools, etc. The primary responsibility is safety, and the talent is to show a direct correlation between the classroom and the real world. Social Studies teachers incorporate globes, history textbooks, and current events found in newspapers and online; thus, bringing a better understanding of different cultures, religions, and ways of life to the forefront. English Language Arts instructors integrate Shakespearian plays, poetry, essay writing, and novels to improve written communication skills and inspire creativity and imagination. Math instructors use protractors, overhead projectors, geometric shapes, math manipulatives, and other items to offer visual demonstrations. The main goals are to help students tackle everyday situations that involve math and prepare them for the next academic level. Regardless of the position or grade level you are interested in, you must be able to tackle the basic responsibilities and make the teaching experience your own. Bring the classroom to life via unique methods that work for you and excite your students. This is a talent that you will develop over time. But for right now, take it one step at a time, and look forward to your new career! Continue to take professional development to move your career in education forward. Which subject area did you excel at when you were in school? Are there any topics that you already have experience with? For instance, if you are an engineer or an environmentalist, you may want to look at Science; a choir director may lean toward Music; an archivist would thrive in Social Studies. These are all just examples, of course, and may not necessarily suit your own situation, skill set, or desire. Once you have chosen a course that you know you will enjoy and think you can effectively teach, you then need to pick a grade level. Each level of education (elementary, middle school, high school, and post-secondary) requires its own certification and unique skill set. The more open you are to teaching different grade levels, the better chance you will have of finding opportunities. So, try to keep an open mind during the job search process. These students are being introduced to most subject areas. So, if you are looking to teach the rudimentary elements of a course, then this is the educational level you may wish to focus on. Students in this age group tend to really enjoy learning and are very enthusiastic, which can be incredibly rewarding for teachers. However, you will need to come up with creative lesson plans to hold individuals’ attention and ensure they remain intent on learning. Teaching middle grades can be a challenge, as pupils are at a more rebellious stage, and may or may not want to learn. If you are keen on a challenge, have extraordinary interpersonal skills, and want to teach more than just the basics, this is the right group of learners for you. Students will prepare themselves for post-secondary education and the working world. The marks they earn in twelfth grade will determine what academic institutions they can enter and what field they may wish to pursue. If you want to deal with students who are practically adults and are able to grasp concepts at a higher level, then you may want to look at becoming a high school instructor. Teaching at a higher education level requires a completely different set of credentials, usually including a master’s degree or a Ph.D. in education. You will not only be teaching but working with students who are there to learn and develop their knowledge base in a particular field. Before deciding which type of position you want to pursue, you may also want to consider which areas are in greatest demand in your local school district(s). Some schools have cut funding entirely for programs that are not part of the core requirements, so before picking a position in Physical Education, Art, or Music, check to make sure these are even available in your area. As well, depending on the state or region, there may be a shortage of Math or Science teachers (for example). If you are having a hard time deciding between two or more subject areas, this may be a good tiebreaker for you. Furthermore, even if you do pick a certain subject or age level now, it does not mean that you can’t change your mind later. Perhaps you start off in Social Studies but find that you are better suited for English Language Arts; or, maybe you begin as an elementary school educator, but find you’d prefer teaching an older age group, so you progress to middle school. Nothing is written in stone and you can always alter your teaching area. If you are unsure if you want to change careers to teaching there are some questions you can ask yourself. Do you need help creating a strong resume and cover letter? Contact Candace today at candoco@telus.net. Feel free to view our services here.